While the schedule is still preliminary, we have already some confirmations from our speakers. We are happy to announce Dr Jessica Barker as the keynote speaker for DeepSec 2017. Information security has a lot to do with interactions. Despite AI (a.k.a. Assisted Intelligence), „smart“ assistants (a.k.a. paper clips on steroids), and a metric ton of gadgets we still have a lot of contact with human beings. Marketing departments and tech people lost in code often forget this. Jessica will give you something to think about which you can’t discuss with Siri, Alexa, the Google AI, or even HAL 9000. Bruce Schneier popularised the concept in 1999: cyber security is about people, process and technology. Yet almost two decades later, the industry still focuses so much more on technology than the other two dimensions of our discipline. For a long time, when the cyber security community has considered the human nature of cyber security, it has been within the context of a narrative that ‘humans are the weakest link’. In this talk, Dr Jessica Barker will argue that, if that is the case, then that is our failing as an industry. With reference to sociology, psychology and behavioural economics, Jessica will discuss why social science needs to be a greater priority for the cyber security community. Curious? We are! Get your ticket to DeepSec 2017 and listen to Jessica’s presentation! Dr Jessica Barker is a leader in the human nature of cyber security. Equipped with years of experience running her own consultancy, she recently co-founded a new cyber security company, Redacted Firm. Her consultancy experience, technical knowledge and sociology background give her unique insight, and she has a talent for translating technical messages to a non-technical audience. 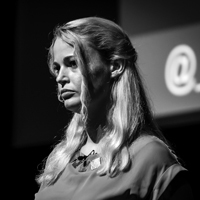 Jessica delivers thought-provoking and engaging presentations across the world, at corporate events as well as practitioner and academic conferences. She also frequently appears on the BBC, Sky News, Channel 4 News, Channel 5 News, Radio 4’s Today programme, Radio 2’s Jeremy Vine show and more. She has been published in the Sunday Times and the Guardian, and frequently in industry press. She is regularly commissioned to write cyber security blog posts, and runs the website www.cyber.uk, dedicated to cyber security news, information and guidance. This entry was posted on August 24, 2017 at 17:24. You can follow any responses to this entry through the RSS 2.0 feed. Both comments and pings are currently closed.